Dinner with a view, that was my initial thoughts the moment I stepped into Aroi Dee Thai Restaurant on the 8th floor of Palm Garden Hotel, IOI Resort City Putrajaya. 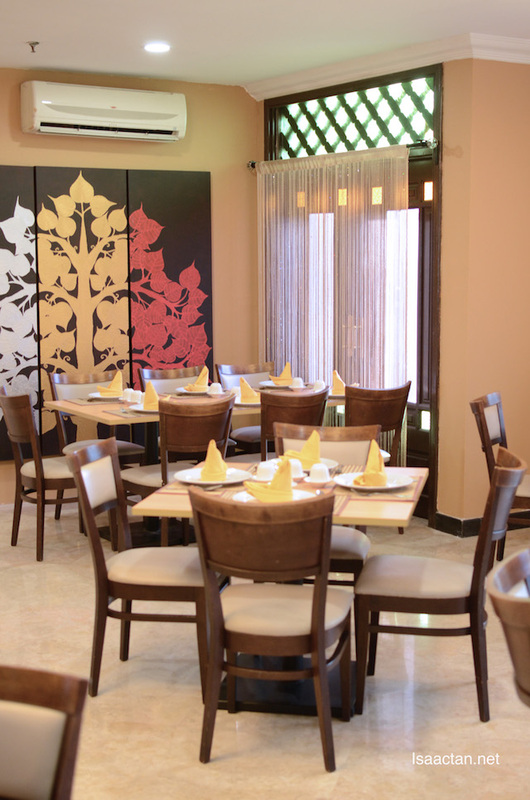 It's a relatively new restaurant serving really nice Thai cuisine. I had the opportunity to try out their fares the other day, so do read on below on what we had that evening. 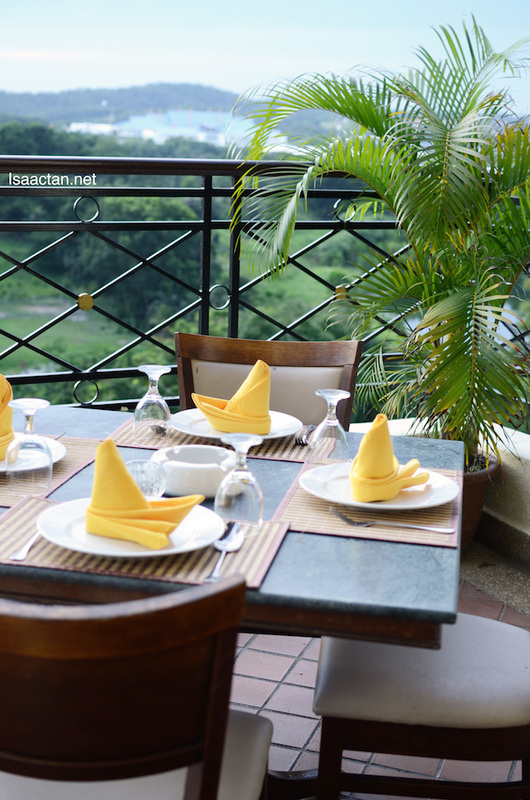 I did like the fact we could enjoy our yummy Thai cuisine in a nice environment. Sitting outside, we could look out at the cool scenery, which can change a normal outing with your better half into a romantic and sweet one! Aroi Dee introduced to us a new menu selection of single dishes on top of the existing a la carte menu for the set. Now here's an interesting appetizer dish, which I initially thought to be dessert. 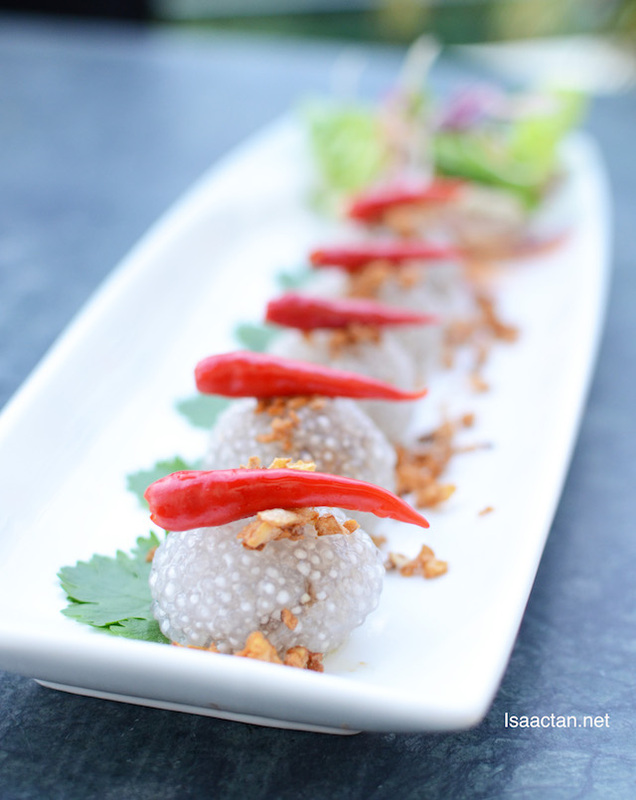 Chef Seeri's special Saku Sai Gai is essentially sago with minced chicken stuffed into the ball. There's peanuts on the side, which is rather nice. It could do with less sago though, as it gets overly chewy after a few bites. 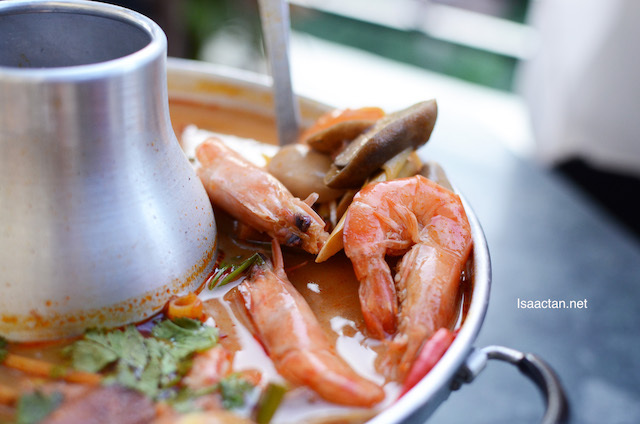 What is Thai cuisine without their spicy red tom yums, and here at Aroi Dee we were treated to their Seafood Red Tom Yum Soup which hit all the right notes. A really yummy offering, using home made roasted chilli paste, the pot is filled with a variety of freshwater prawns and soup. It was a spicy affair, as can be seen from the colour of the red soup even before we took a sip. Good stuff. 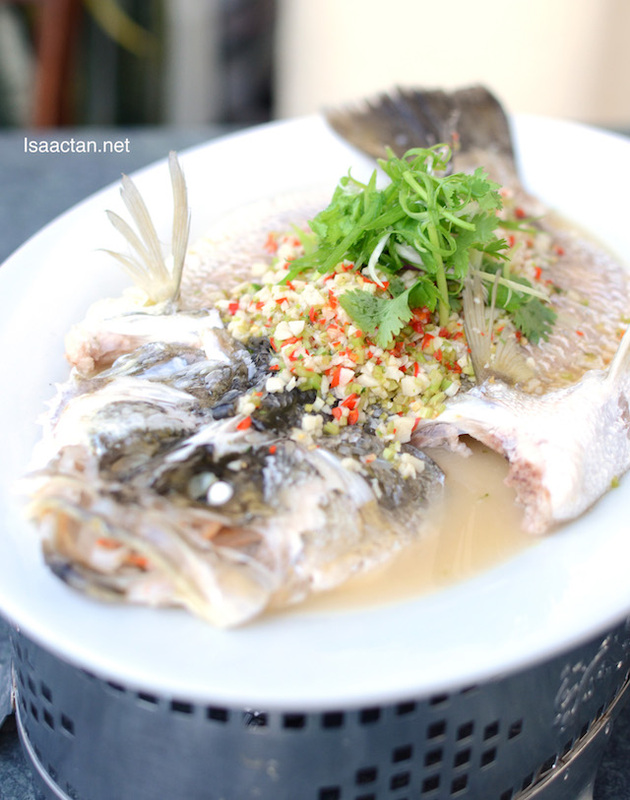 Those who love steamed fish will do good to order Aroi Dee's Steamed Sea Bass (Siakap) Thai Style. Steamed in a light and tangy lime base, the cili padi inside added to that kick needed in the Thai styled dish. The fish is really fresh, without any hint of staleness, which is very important as it will definately show when steamed. I've always liked the Thai Pandan Chicken dish. Here at Aroi Dee, the chef whipped up one really nice dish. 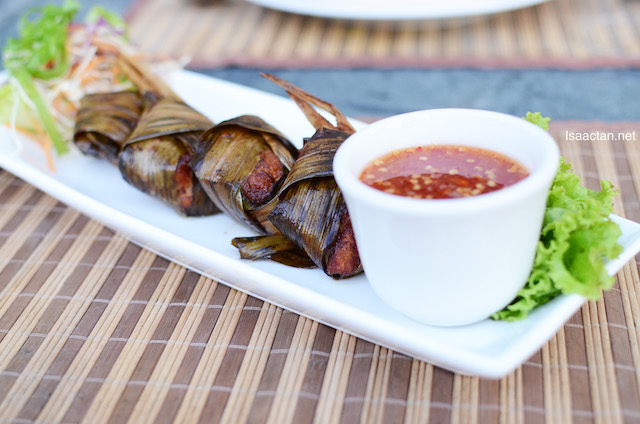 The aroma was good, which reflected in the flavour and taste of the chicken wrapped in the pandan leaves. I couldn't resist taking and extra piece, chomping it down with my tom yum and white fragrant rice. 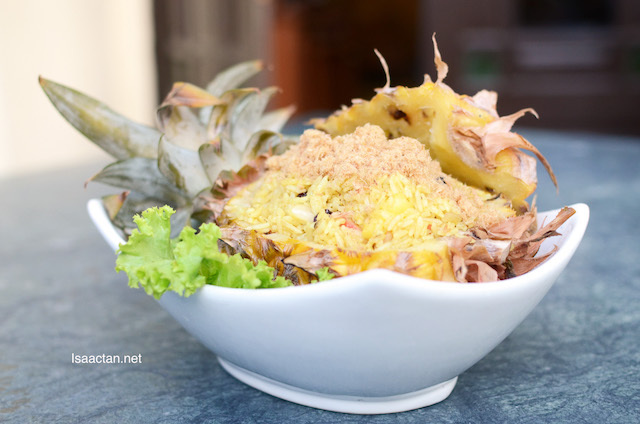 Another good Thai dish, the Pineapple Fried Rice with Seafood & Chicken Floss came served in a whole piece of pineapple. The fried rice is good to be taken in itself, complemented with sweet prawns, and generous servings of seafood and chicken floss. Another highly recommended dish, as it was indeed a tasty offering. 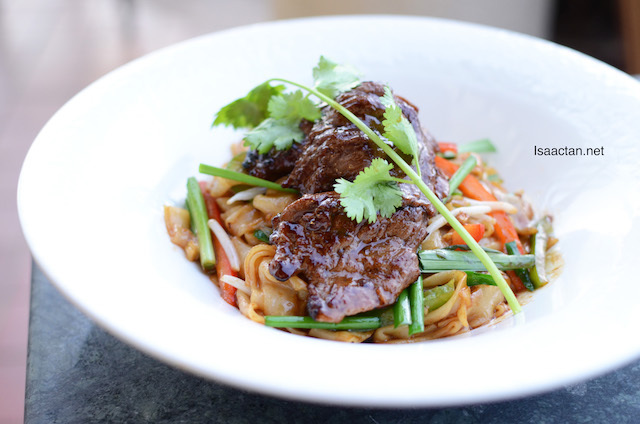 Love the sweet, really tender and flavourful pan fried tenderloin beef, not so the kway teow. Aroi Dee's Pan Fried Tenderloin Beef served with Kway Teow got me excited as I'm always looking for a good yummy kway teow offering. Anyway, love the meat to bits, as it wasn't tough at all. We ended our meal with some sweet dessert in the form of the Sangkaya Phek (Yam Egg Custard). 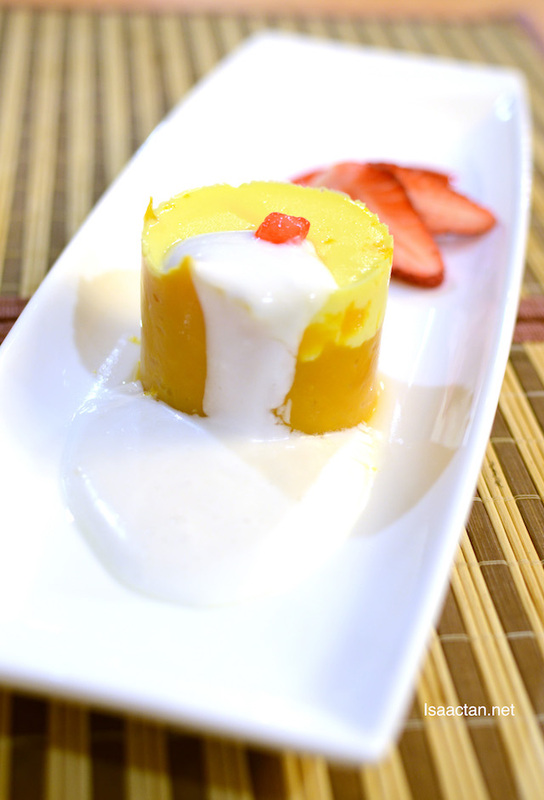 Served with lots of creamy, thick coconut milk, the egg custard has a soft texture to it. Eaten while its hot, it's indeed a sweet ending to our wonderful meal at Aroi Dee Thai Restaurant @ Palm Garden Hotel, IOI Resort City Putrajaya. Do drop by their restaurant on the 8th floor the next time you're around the vicinity and looking for some nice Thai cuisine. Yummmm!!!! I love Thai...and the view is absolutely stunning. Take me there! This place is really nice.. I wanna eat thai food! Been there for lunch or dinner a few times. The menu never failed to impress me. Always enjoyed myself over the Thai cuisine. The Thai Pandan Chicken looks so delicious. Want to go there to eat. Verry nice outdoor sitting view! The Sangkawa Phek looks really good. That steamed fish... and that red Tom Yam... is making my mouth water.... want some!!!!! !